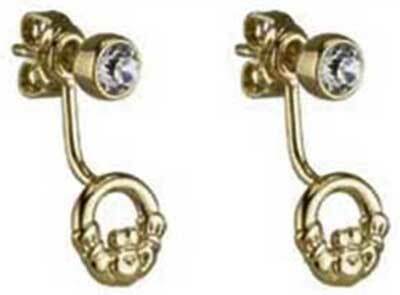 14K Yellow Gold Claddagh Drop Earrings with CZ stones from Solvar Irish Jewelry. Drop Earrings on Posts with CZ Stones. 1/4” Wide x 3/4” Long. Solvar Irish Jewelry is Made in Dublin, Ireland.